Large facial pores can be an unsightly as well as frustrating problem to fix. According to DermaDoctor, pores can become visible and seem larger due to inadequate skin care and issues such as blackheads, which can expand your pores. Genetic factors, environmental damage and aging also contribute to pore size. Luckily, you don't have to suffer for the rest of your life with large pores. Exfoliate your skin twice a week. Dead skin cells, dirt and debris can clog your pores and cause breakouts. According to Janice Cox in her book, "Natural Beauty at Home," you can use a moist cotton washcloth to gently exfoliate your face. Don't scrub your face too roughly or exfoliate blemished or broken out skin or you may cause irritation. Steam your face once a week. According to Daily Glow, steaming your face can help to open your pores and remove debris, oil and other impurities from your pores. Boil a pot of water on the stove. Remove from heat, and set it on a heat-proof surface. Place a towel over your head and allow the steam to work for around five minutes. When you are finished, rinse your face with lukewarm water and gently pat dry. Apply a homemade oil-controlling facial mask right after you steam your face. The best time to use a facial mask is right after steaming because your pores are open and the mask will be able to penetrate more deeply. According to Joni Loughran in her book, "Natural Skin Care," clay masks are beneficial for blemishes and absorbing excess oil. 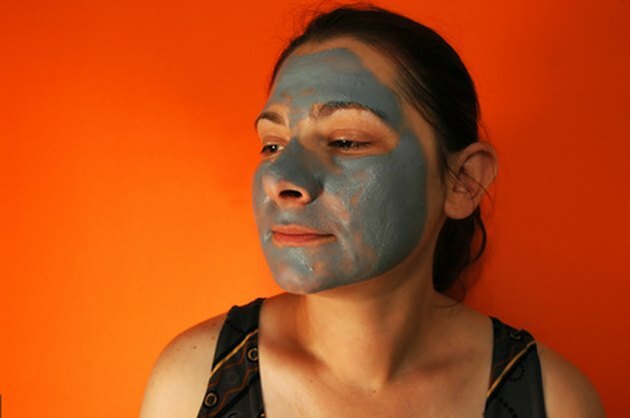 Clay masks also help to shrink your pores. You can make a antiseptic, oil-controlling mask at home by mixing 1/4 cup carrot juice with 1/4 natural clay. Apply the mask to your face, avoiding the area under your eyes. Allow it to sit for 20 minutes, then rinse well with cool water. Cleanse your face every morning with a natural pore-cleansing facial wash. Mix 1/2 cup water, 1/4 cup whole milk, 2 tbsp. baking soda and one egg white in a small bowl. According to Janice Cox, these ingredients help to deep clean your pores and kill surface bacteria that may clog pores. Gently massage the mixture into your face and rinse well with lukewarm water. Swipe a natural pore-reducing astringent such as witch hazel over your face using a cotton ball. This will help to remove any remaining residue, shrink your pores and help to control oil. Moisturize and tone your face with aloe, which has natural pore-tightening properties. According to Loughran, aloe also has balancing, blemish-controlling, moisturizing and toning properties that make it an effective moisturizer for problematic skin. You can obtain aloe gel by breaking off the leaf of an aloe plant and squeezing the gel into a small bowl. Apply this gel to your face and allow to dry.